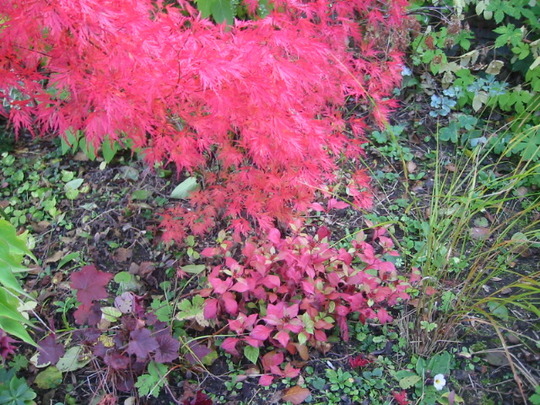 Wish I knew the name of this Acer – our best at this time of year . . I love this Acer ‘griseum’ (peeling bark), but it is 12 feet tall now, and growing! Previous post: ? Last chance to enjoy autumn colours - inspired by Bampy! I love Acers this time of year. 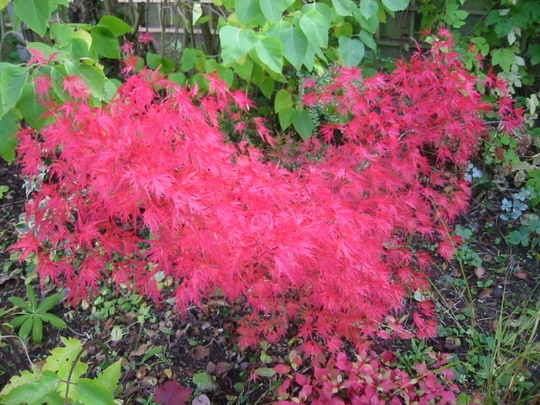 It is a type of Acer palmatum dissectum but what type I can't say. It looks positively warm to the touch - great this time of year. You have some beautiful specimens there Sheila. I too love acers, haven't they been spectacular this year?? Epimediums are really useful too, yours are looking good. 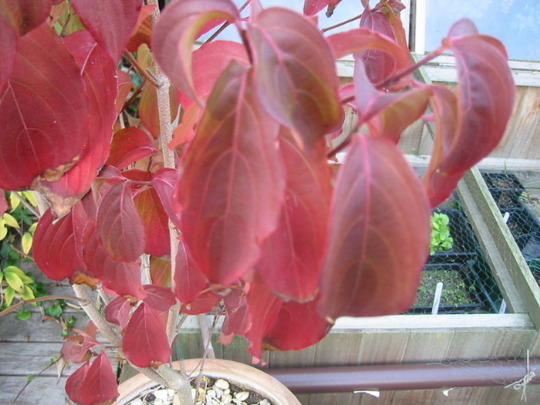 I have always wanted to grow Cornus kousa chinensis. The fact it needs ericaceous soil has put me off. Have you had yours very long? Great photos great colours at this time of year! Thanks very much Joanella - I can't get over that eye-popping red! Thanks Poppy . . . I've had two other flowering dogwoods for more than five years, which haven't flowered :(( So I bought this one in April this year, and am trying it in a pot - if it flowers next Spring I'll be thrilled. Absolutely Bill - thank you (love the name!). Lovely - all of them! 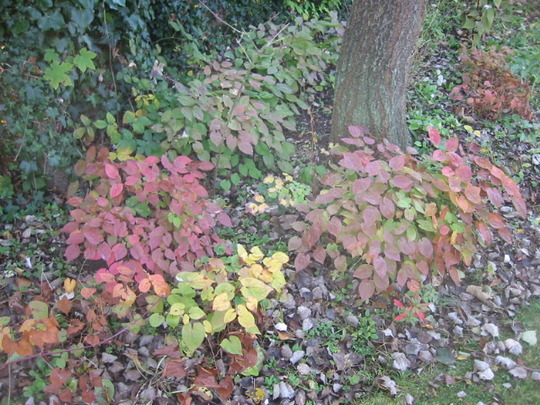 Not 'Emperor' Bilbo - the leaves on that are more purple . 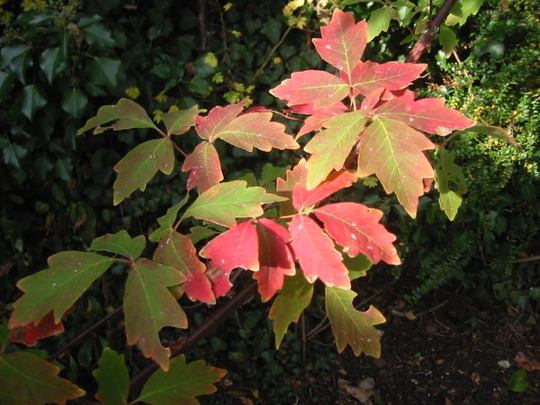 . . it might be Acer p. 'Shidare'? Can't help, Sheila, but what a beauty; Lovely photos. Wow! 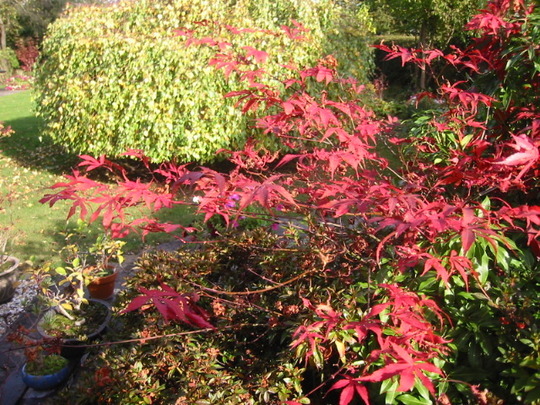 Spectacular Acer Sheila...and all the rest are lovely as well. Cornus is a wonderful do-er isn't it. I love them all! Thanks Karen - nice to see you here again!! Celebrating 12 months of having a garden! Who would guess it's the 30th March?! Hi Janey!